Led Spot offers a comprehensive selection of indoor and outdoor commercial lighting supplies to contractors, builders, architects, and designers. All of our lighting fixtures and accessories are made exclusively in the United States by established and reputable manufacturers. Our products are either standard commercial grade or specification grade lighting fixtures, lamps, poles, mounts, and other accessories. This allows the commercial lighting contractor to rely upon LED Spot as a single point of procurement. We have no quotas to fill with any specific manufacturer or product, and thus enjoy an impartial distributor relationship with multiple manufacturers. Commercial lighting designers can trust us to supply them with equipment they need to buy for their clients, not that we need to sell for ourselves. This gives the contractor more freedom of choice and the client more options to choose from. In many respects, you might say that Led Spot is a virtual lighting agency. Unlike many competing entities that are entrenched in brick and mortar and limited to specific geographic regions, we have unlimited supply and distribution network that stretches from Coast to Coast. We deliberately restrict our offerings to American-made products, however. We believe in supporting American industry, and we are convinced that United States still manufacturers the very best commercial lighting supplies found anywhere in the world. This allows us to pull stock from a number of key geographic centers and fast track commercial lighting supply orders in as little as 2 weeks. Contrast this to the industry standard 4-6 week delivery time, and you can clearly see the advantage of working with a virtual lighting agency whose expedited drop shipping gives the contractor the power only to propose, but to deliver. Contractors who operate only in specific areas often encounter parts shortages at the worst possible times. In regions of the country where light fixture regulations and dark sky laws suddenly change, the unavailability of the best commercial lighting supplies can cost a company a bid. Brick and mortar distributors in these areas usually cannot help because they are limited by the same geography and suffer from the same parts shortage themselves. 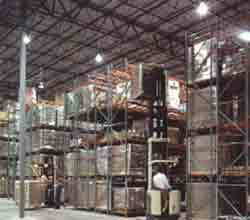 Contacting manufacturer agents on a state or regional level often does little to improve the situation either.These agents are usually loyal to one or two major manufacturers and are going to take advantage of the contractor’s desperation by pushing only the commercial lighting supplies their representative distributorship is paid commissions and bonuses to source. This limits the proposal to someone else’s profit margin, and it serves neither the lighting designer nor the client at the end of the day. Led Spot strives to break the proposal free of such limitations. Not only do we maintain an impartial stance toward manufacturers during the procurement process, but before we even invoice a purchase order, we take an active role in planning, consultation, and systematic site analysis. We offer every commercial lighting contractor a free photometric analysis of the client’s location. We detail necessary light levels in order to ensure compliance with mandatory foot candle requirements, and we recommend locations for fixture placements that will contain illumination within the boundaries established by dark sky laws and restrictions on glare. This gives the contractor not only the advantage of being able to pick and choose from any number of top-brand manufacturers, but it also cuts the time of fixture selection by more than half. The client has an easy to read, visual reference at the end of this process which makes winning the final bid a matter of simple demonstration rather than strenuous persuasion. Led Spot carries a wide variety of industrial & commercial lighting fixtures. If you can not find what you are looking for call us and we will find it for you. Our home office is located in Houston, Texas with warehouses located throughout the United States that enable us to service all 50 states.